The Buy Nothing Project’s goal is to encourage 365 days of gifting. The main rule of the project is simple: you cannot buy or sell items through the project; it is only about giving and receiving. The project hooks you up with a local chapter. You can only be a part of one chapter at a time and must live in the chapter’s boundaries. This makes sense for picking items up, since everyone lives close by, but it also encourages community. What better way to help build community then by giving and receiving to/from your neighbors? Giving to a person feels good! Take a look at Why Being Generous is So Good For You. It feels rewarding handing an item to an actual person. I love meeting my neighbors when they come pick things up or when I go out to pick things up. It just feels neighborly! There is so much stuff in this world. Why buy something new if you can receive the item you need/want from someone who no longer needs/wants it? Reusing someone else's stuff not only helps your wallet, but helps the environment by reducing the need for new stuff to be produced. This was perfect timing for us, as we needed to get rid of a ton of stuff to make room for the coming baby. We cleared out our guest room to make a nursery. We then consolidated the office/junk room into an office/guest room. This has been a challenge as this room had become overrun with stuff. Way too much stuff! Plus, we needed new (to us) stuff for the nursery. 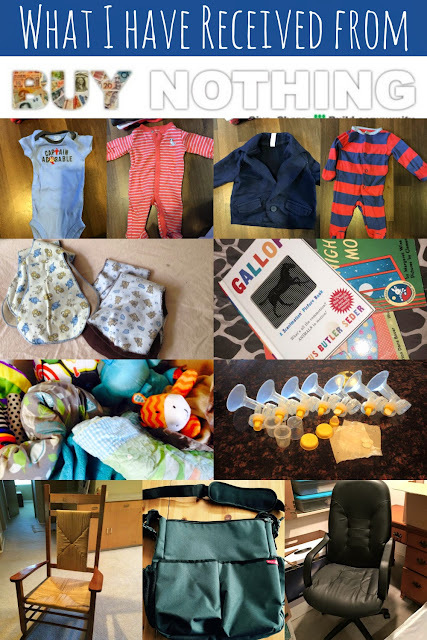 We have been blessed with a ton of hand-me-down clothes, books, rocking chair and other baby gear. It has been a truly a positive experience. We had a TV stand that we needed to get rid of ASAP last night, since the new one was getting delivered. I posted it on Buy Nothing, asking when can you pick it up and picked the quickest. We had that TV stand gone in under 2 hours! A neighbor of ours rushed over with his truck. Him and my husband carried it out to the truck and it was gone! If we had to take this to Goodwill, we would have had to rent a Uhaul van. Then we would have planned a big Goodwill run with as much as we could to make as much use of the van as possible. AND we would have had to find someone to help my husband load it up, since I'm pregnant and am not going to be as helpful lifting heavy stuff as I used to be. This just made Buy Nothing even more convenient! Buy Nothing specifically states in it's mission that it does not distinguish between need and want. Even so, I still see this group making positive impacts on those in need. In my few weeks of participating in the project, I have seen several people with real needs get generous support from their neighbors. I have seen foster parents get on needing a car seat and clothes for a foster child they are receiving that night and neighbors pull through for them. I have also seen people get on and say they have no furniture and are broke and neighbors generously give what they can to help them out. I also have seen people post that their food stamp card got stolen and they now have no food for the next couple weeks. Again, neighbors pull together and delivered dry goods from their pantries and extra food that they have on hand. My husband has already accused me of being addicted. He's not super enthused about all the baby stuff I have brought home, but has gotten excited over some of the non-baby stuff. It's also been great for getting rid of stuff quickly! It's just so much fun to give and receive stuff! It's like Christmas all year round! A fellow bus rider suggested I join the Buy Nothing Project when I told her I was still looking for a rocking chair for my nursery. She informed me that she sees a ton of baby/kids stuff get put up through Buy Nothing (perfect for us nesting mommies!). She also then told me you can ask for what you are looking for. I put up a post asking for a rocking chair... and guess what? I received one that weekend. I was so happy to check this off of my nursery list! And it was free! It has been so handy in our purging and baby gear acquiring phase! I imagine we will be members of this group for a good while. I can see us continuing to acquire children's stuff for a good long time, but then putting up the no longer needed things after baby #2. It's going to be a great group to be a part of throughout our parenting years. 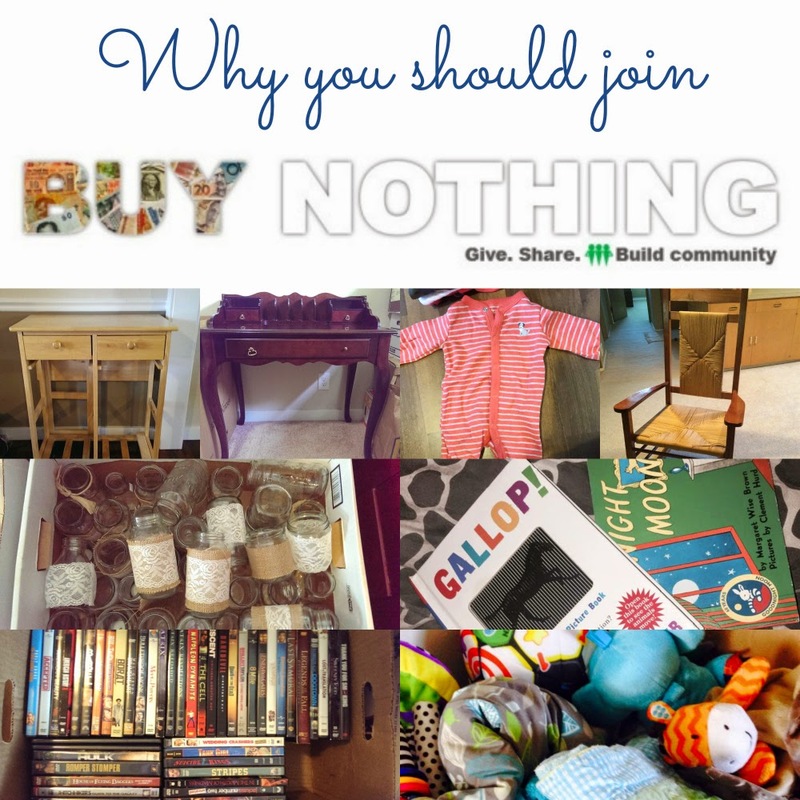 So go check out the Buy Nothing Project website and see if they have a local group in your area. If not, you can also start your own chapter! What do you love the most about giving? Share with us in the comments below! You should definitely give it another try. 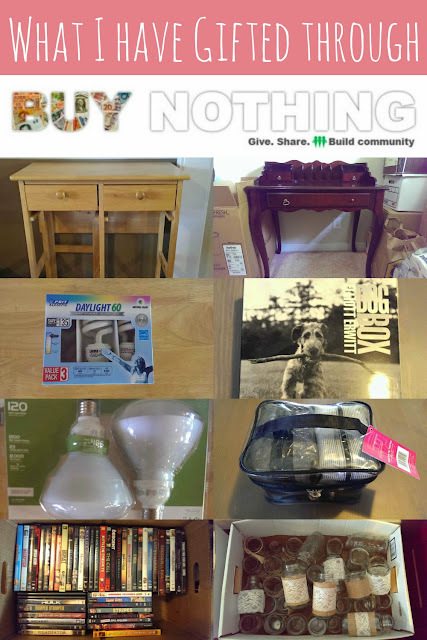 So far we have had great success with Buy Nothing. Although, I have noticed that the group can get a little bit dramatic on facebook. Sometimes I think people never grew up from middle school. lol! I've never heard of this. What a neat idea! Hope you're doing well. When is baby due, again? Baby is due July 15th, but due to some complications we will probably be scheduling a cesarean on July 8th. We are having to go into the doctors and monitor him every week, so we have had a couple weeks of, "is this going to be his birthday?" So far he is perfectly healthy and stable, so we are trying to get him to 39 weeks before a planned cesarean. I mean, what you say is important and all. However imagine if you added some great images or videos to give your posts more, "pop"! Your content is excellent but with images and clips, this blog could definitely be one of the very best in its niche. In spite of the fact that most best three-year-old steeds Breeders Cup 2018 Live Stream switch influence their first begin at age two, To legitimize didn't race until February of this current year, winning a race at Santa Anita Park in California by 9 1/2 lengths. He won his five resulting races, including the Kentucky Derby, Preakness, and Belmont, and resigned undefeated, with income of $3.8 million. He is the main steed to have won the Kentucky Derby without having dashed at 2 since Apollo in 1882. "Unfortunately you don't make much.. Melbourne Cup 2018 Live Stream because of the traffic you can't pick up many fares." With nearly half of Cup patrons travelling to the races by train, Melbourne Cup is a big day for Flinders Street senior station master George Panoussis. Preparations for the day start months in advance, but with services leaving for Flemington Racecourse every four to eight minutes, one late train can throw the whole schedule into disarray. I really enjoy simply reading all of your weblogs. Simply wanted to inform you that you have people like me who appreciate your work. Definitely a great post. Hats off to you! The information that you have provided is very helpful. financial management and budget preparation.